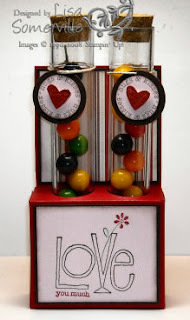 Here's a few items I've created with items from the Love You Much Promotion, great gifts for Valentine's, or room parties! 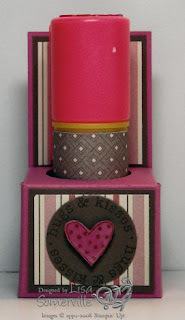 For this one - I used the Double Test Tube Holder Pattern that I created. For this one - I created a scaled down pattern of my Test Tube Single Holder Pattern. This pattern, will hold a small Push Pop Sucker - or smaller sized Test Tubes. If your looking for Test Tubes, Melissa at The Rubber Cafe has some in stock - not the same exact ones I've been using - but they do work. Love the holder for the push pop. Think I might try this one for little bits class this year. Lisa-Lisa-Lisa! How cute are these?! Love them!